This time around, I was given Kate’s blog, Kate’s Recipe Box. She’s got a lot of great things to chose from and I had a few bookmarked, but ultimately, my need for a quick breakfast (as well as using up all of my blueberries) won over. 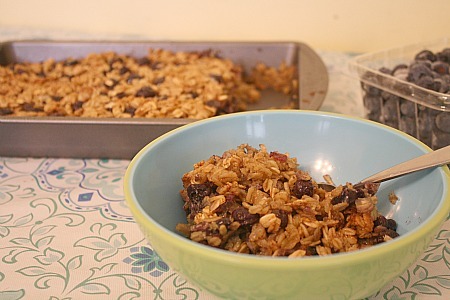 Plus, I hadn’t tried baked oatmeal yet, but have been meaning to for a while. I’m glad I finally did! Preheat oven to 350 degrees. Combine oats, sugar, baking powder, cinnamon and salt in a large bowl. Mix milk, butter, eggs and vanilla in another bowl, then add to oat mixture. Stir until combined. Gently mix in blueberries. Spoon into a greased 9 inch square baking pan and bake for 40-45 minutes until set. Serve warm. Refrigerate leftovers and reheat before serving. This entry was posted in berries, breakfast, make ahead. Bookmark the permalink. I love baked oatmeal. Gald you enjoyed this! 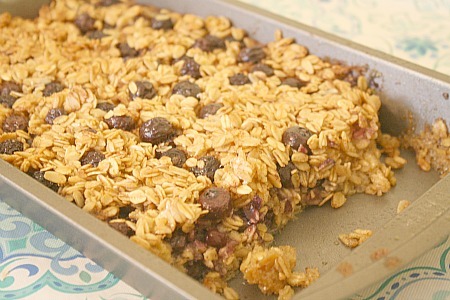 Baked oatmeal is a favorite of mine! This sounds wonderful! I love oatmeal but have never had it baked! It must feel like eating dessert for breakfast! Baked oatmeal sounds like fun. Great idea! Never had this. It’s sound delish and seems easy, so I will definitely be trying it.